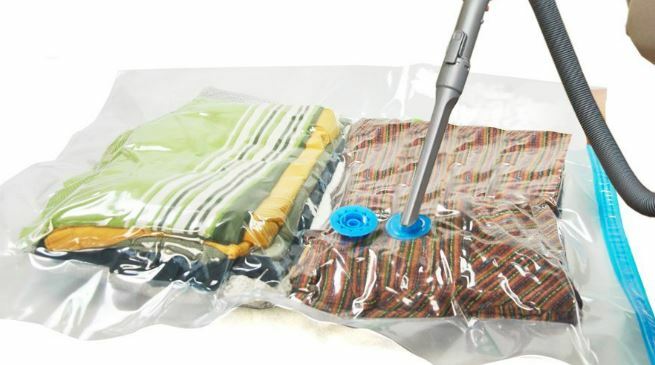 Vacuum sealer bags for blankets will definitely help you save important storage space. They have been around for years, but for some reason, they are only now starting to get traction. Our bed linings and blankets are usually one the biggest space takers in every house. How many times have you found out that you could fit a lot more in your close if comforters and blankets would not exist? I can tell you it happened to me a lot of times. First of all, you can clear some space. The amount of empty space you can extract from this operation is sometimes enough to fit your entire personal wardrobe. No mold or bacteria will damage your comforters. We are so annoyed when our favorite bed sheet has holes or mold. With vacuum sealers, we can avoid such problems. The question of dust and weird smells. Again, taking out your bed sheets and finding out they are full of dust or have weird smells isn’t the nicest thing. You can also put other things in those bags. Clothing, table covers or just about any textile you can think of. Step 1: Try to make sure you insert clean bed linen into them. The cleaner, the better. When you eventually take them out again you can directly use them. Step 2: Carefully insert them into the vacuum storage bag one by one. Try to respect the manufacturer’s indications about the maximum quantity you can fit. Don’t crowd everything in one bag. Close the zip bag. Step 3: Take your vacuum cleaner and push it uppon the bag’s nozzle. Now turn on your vacuum cleaner and let it do its magic. You will see your blankets shrinking immediately. It will take around 20 sec for full effect. The biggest problem which you could face is a bag with holes in them. This can be visible or not, but it will definitely lead to overall deflation. The bigger the hole the faster it will deflate. General problems with such bags are usually the invisible holes or slow deflation. We recommend that in such cases you must contact the supplier. Most reliable suppliers will just switch your product immediately, no question asked. Don’t worry too much if you see deflated bags. Contact the supplier and problem solved. They are not necessarily low quality rather it’s just an industry thing. As I told you, most suppliers will immediately switch them, no question asked. Another issue you might have is not being able to vacuum the air. This happens very rarely. In such a case, search for visible holes. If there aren’t any, check if you haven’t stuffed too many textiles inside. Please, try not to stuff too many inside of them. The bags will work great, as long as you are reasonable with how many you are stuffing inside. As long as you keep that in check, you will reuse them again successfully. Otherwise, they might even “explode”. By this, we don’t mean an actual explosion, rather than a very fast deflation. More or less most vacuum bags for textiles do the same thing. 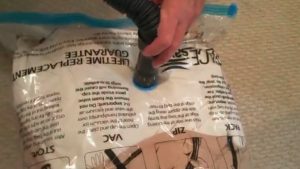 But there are some aspects you should check before buying sealer bags specifically for blankets. When you do need good vacuum bags for blankets, check the size they offer. We have seen most suppliers offer 40×30 bags. These are big enough to stuff a lot of bed linings in there. They will also work great if you travel as you can fit a lot of clothing in there. Don’t worry too much about the bag being too big, as long as you’re reasonable with the load, you can fold them. The above features 10 Jumbo Bags. This is for bed linen only. The above product features 12 bags of mixed sizes. 3 Bags for each size. Can be used for traveling. Make sure you are buying from a reputable source. This kind of manufacturer has sold enough products to be able to test his item. He also knows what material should be used for such a task. Remember that your body is in direct contact with the material. No Mold, mildew or bacteria should be on them when you do use them. It won’t do you much harm, but it’s not a nice feeling to know you are sleeping in the mold. To be honest, such products often tend to have defects. It’s just the nature of this industry. But you still need to use them so you must find a way to work through this. So focus on buying from sellers that will replace your bags if any problems occur. Don’t panic, just contact them and they will help you with this. Yes, you won’t have your vacuum machine with you all the time. Therefore, either by a pump or just buy a product that includes a travel pump. These are good to carry around with you on trips. They will help you carry more in less space. A word of advice though, also carry 2 replacement bags with you just in case the initial one stops working properly. These bags are great solutions to free up some storage space in your closet. Good quality ones will help you keep bed linen far away from mold or bacteria. It is also a good solution to prevent any bad odors or even dust from getting on to them. Not just bed lingerie can be stored in these bags. 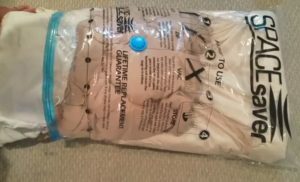 Just about any textile can be stored in these vacuum bags. We provide information on various storage solutions that help you organize or clear your closet. Besides storing blankets, we can also help you with information on the storage of books and also on storage of photographs.